Catching up on things: I had a request to give again the meaning of Fakahatchee. Fakahatchee Strand Preserve State Park is the heart of the Everglades and Big Cypress. It is a slough, or slow moving river swamp that runs from 3 miles north of Alligator Alley down into Florida Bay. It does not have the appearance of a river, but is a major part of the water cycle in southwest Florida. It is about 15 miles long and 10 miles wide. Most of it is state preserve, but not all of it. It has the largest number of wild orchids in the United States, and is the largest or longest strand swamp in North America. It abounds with Florida panthers, fish, birds, and even the largest stand of Royal Palms. It is a sub-tropical environment that is unique to North America. I can say with confident that there is no other place like it. 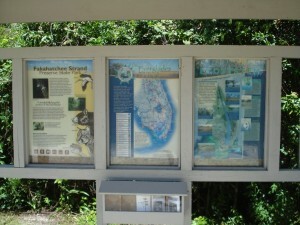 Above: Fakahatchee kiosk panels at the Big Cypress Bend Boardwalk. As most in Florida know, the –hatchee on the end of Fakahatchee is for river or creek. Figuring out the Faka is the hard part. I have narrowed it down to three similar words. This is from the Muskogee Creek/Seminole language, as are most geographical terms in Florida from aboriginal origin. Unfortunately my sources of speakers of Muskogee are limited. The language tonal, and words are often mispronounced when said in English, which turns them into another word entirely. An example of this would be the Loxahatchee River, which did not originally mean turtle river, but that is what the non-Muskogee speakers believe it to mean. Where the Fakahatchee name was first applied would give us a clue to which meaning of these words fits best. I can’t type in perfectly what the dictionaries say. The first word is Muskogee spelling, followed by pronunciation, and then the English words. “A Dictonary of Creek/Muskogee” by Jack B. Martin and Margaret McKane Mauldin. “English and Muskokee Dictionary” by Rev. R.M. Loughridge. In order to figure out the meaning of the name, we have to find out where it was first used and applied. The Fakahatchee we know today is not the same Fakahatchee on maps and descriptions before the 20th century. It seems as if the name was applied to the preserve just to give it a local, native name, without historical precedence. On earlier maps, the name is not applied to the preserve area at all, but to rivers that are tributaries to the estuaries in the Ten Thousand Islands. So the –hatchee was very appropriately used where it first appears. The name first shows up on American military reports and maps during the Second Seminole War. Captain John T. Sprague in his 1848 book, “The Florida War.” And on his very inaccurate map of southwest Florida, he has two different Faka-hatchee rivers! One is most likely the Turner River, and the other could be the Chatham River. Sprague’s information is from expeditions in the Everglades from 1840 to 1843 when the Army and Navy conducted extensive scouting expeditions to locate hidden Seminole villages. 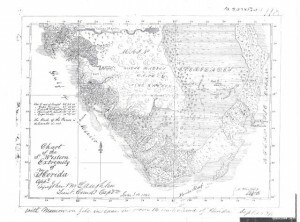 The Fakahatchee name does not appear in the earlier 1837 book with map, “The Territory of Florida,” by John Lee Williams, where it described an attempted survey of the Ten Thousand Islands area in the 1820s. 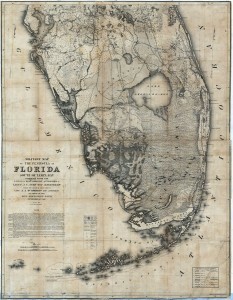 Above: 1841 McLaughlin map, which is believed to be what Sprague used to create his map in the 1848 "The Florida War book." The 1856 map of south Florida by Lieut. J.C. Ives is a little better and has more familiar names and places, but still has problems. What appears as “Fah-kah-hatchee or Muddy Creek,” may now be what is called the Huston River, adjacent to the Chatham River. In the notes, we see that he used reports from 1842 to create that portion of the map, so it is really no accurate than what Sprague used. What is now Halfway Creek and Turner River, seems to be labeled Wekiva River. But the map does have labeled the Ok-ol-oa-coo-chee, which seems to cooresponds to what is today Big Cypress east of highway 29, and does correlate to where the water flows from today’s Okaloacoochee Slough. None of these Fakahatchee or Fah-kah-hatchee are what is today Fakahatchee Strand Preserve. So due to the very inaccurate maps of the time and confusing placement of the name Fakahatchee, which does not correspond to what we call Fakahatchee today, this is a problem. Was the area we call Fakahatchee Strand today just given the name by 20th century folks? It doesn’t seem to have a name labeled on the 19th century maps. Could these be Fakke-hatchee, or muddy river like on the Ives Map? I have always doubted this, because the water flowing out these rivers was not naturally muddy. It was so clear coming out the Turner River by Chokoloskee Island that the ships would stop there to take the water on for drinking and cooking. They certainly would not do that with a muddy river. Fvka/Faka-hatchee, meaning vine river or artery river is a possibility, because these rivers are arteries or veins of the water of the Everglades. But I doubt that people had that perspective and viewed it that way 175 years ago. I lean more towards Fakv/Fa-ka-hatchee. Hunting or hunter’s river sounds like a good possibility, because this area is well known for hunting in earlier days. One of my Seminole friends says this is the correct interpretation. Also, it seems closer to the pronunciation of the earlier spelling often seen on the maps, fah-kah-hatchee. This term also seems to be an older term that would suit the older maps. That is my answer, but I don’t think we will ever get a more definitive explanation.